All rider fees will be plus a £10 facility hire and will be added to the balance payment. 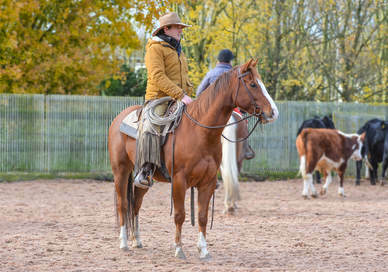 Clinics focus on – Gaining control, confidence and respect from your horse using some structured techniques. Softening/Suppling. Question and answer session. Problem solving. Guy will work on specific problems/advancing as well as general exercises for gaining control over your horse while working inside (and outside of the arena where we can). Mostly the clinics are geared towards the group level, while still trying to address individuals. Guy before. Includes ground and ridden work. For those who need to build confidence. ​A deposit is needed to secure your place on this clinic, all payments must be made using the PayPal link this enables us to a) track who is on the event b) take deposits c) inform you all of any changes to the event. You don't need to have a PayPal account you simply need a bank card and you can log in as a guest. Once you have booked onto the event via PayPal a confirmation email will be sent to you. ​Once you have booked onto the event via PayPal and paid your £50 deposit a confirmation email will be sent to you. If you click on the below link you can pay the balance for the clinic, balances are due 4 weeks before the start of the clinic date we can not accept cash on the day of the clinic, all payments are made through paypal in order for us a) track who is on the event b) collect balances c) inform you all of any changes to the event. You don't need to have a PayPal account you simply need a bank card and you can log in as a guest. Once you have booked onto the event via PayPal a confirmation email will be sent to you.